The following is an enlargement of area 4. The land grant included the Kamas Valley (originally named Rhoades valley), the drainage's between the upper Weber River and the Upper Provo River. The image below is an overlay that I did of the old land grant map with todays satellite image of the area. While the old sketch is not a perfect match to today's topography, you can see enough features that allow us to determine a little better the actual boundaries of the grant. 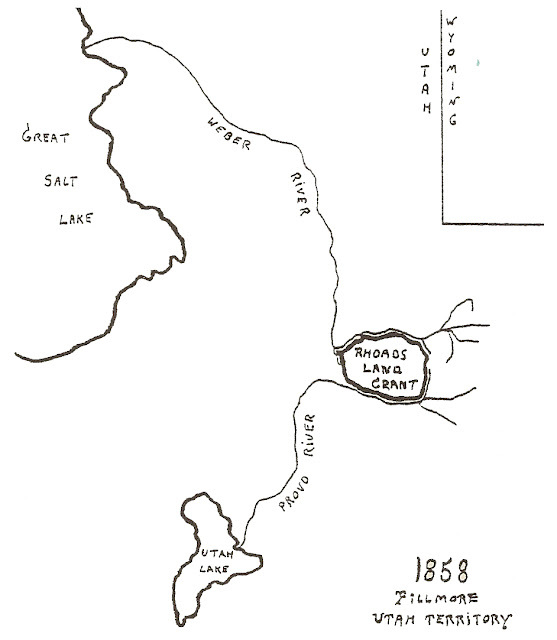 The northern boundary seems to follow the Weber River right up to Mirror Lake and then down the Duchesne River to where it turns up Iron Mine Creek, across soapstone and down to Woodland on the South side. 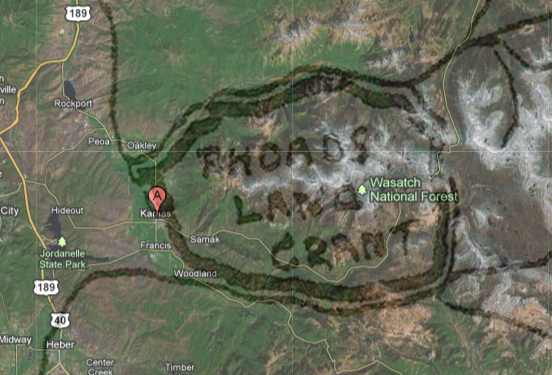 After obtaining the grant and moving to Kamas Valley, Rhoades began to work whatever locations they had just obtained the right to in the grant. He soon fell ill and his son Caleb then took over the work for him. "Family writings say, again, that Father Rhoads and Caleb worked gold mines on this land. Thomas also found "black minerals" in the area - coal that became part of the church mining properties. Caleb reportedly became the largest tithe payer and one of the most generous members of the church in his almsgiving. Many eyewitnesses said they had seen his gold at various times. After Walker's death, his brother, Arapeen, took over Ute leadership and continued to allow Caleb Rhoads to harvest gold from the tribe's secret store. But Arapeen's successor, Chief Tabby, denied access. Caleb made several covert trips to the site after this, family records say. 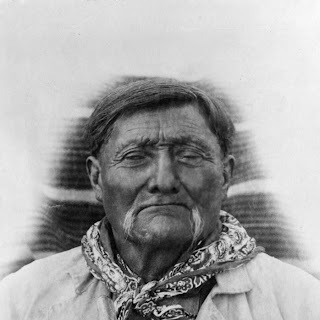 He also petitioned the U.S. Congress for a land lease and agreed to pay the national debt in exchange. 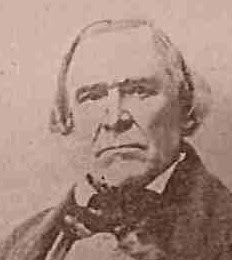 He was frustrated in part by a Utah representative to Congress, George Q. Cannon, who said Rhoads was "only an ignorant prospector and not capable of handling a $100 million deal." 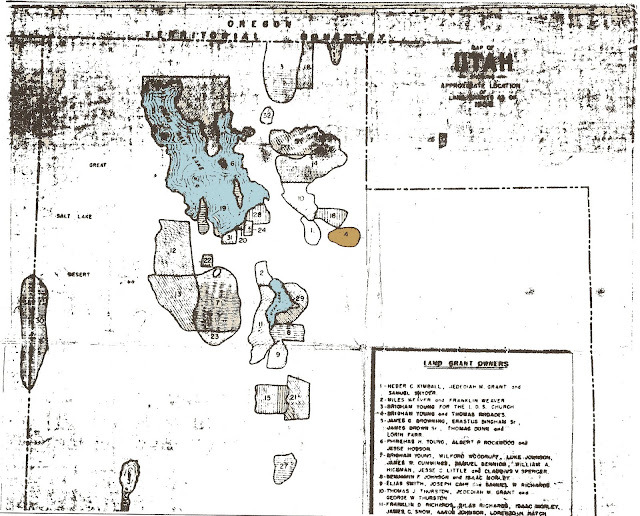 In the end, the petition was denied, and the federal government eventually chartered other companies to mine in the Uintas. Government-paid geologists scouted the area and reportedly found many Spanish artifacts, smelter ruins and other signs of ancient mining. But they never found the fabled Rhoads Mine.